All orders with a subtotal (after discounts are applied, not including tax and shipping) of $300 USD or more will receive free shipping. Items will ship, at our choosing, either UPS Ground, USPS Priority, or LTL. 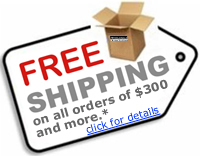 This offer is not valid with custom priced orders or custom manufacturing jobs. This offer is not valid if billed to any third party courier service.